ZNAPS Inc. just released a statement to clarify the “fraudulent information” published by a local HK media. (Hong Kong, 30 June 2016) The news titled as “Crowdfunding raising 18 million manufacturing magnetic cables. The brothers that didn’t shipped their coffee machines perviously.” posted on Apple Daily’s “Instant News” section, and published in the A2 section of Hong Kong’s news today (30 June), titled as “The brothers behind the intelligent coffee machine accused for making the same scam. Missing shipments for government-awarded and 18 million crowdfunded magnetic cable.”. These two news are inconsistent with facts and defaming. Our company would now clarify these important facts, and reserve the right to pursue the matter in court of law. (1) Znaps Inc is company registered in Ontario, Canada. Snaps Limited is the distributor of our company located in Hong Kong. Two companies do not share direct connection but business contact only. (2) Znaps Inc is a independent operating start-up company and named Phiona Leung as the director. It does not manipulated in secret by any individuals, including the Zhao brothers reported by news. 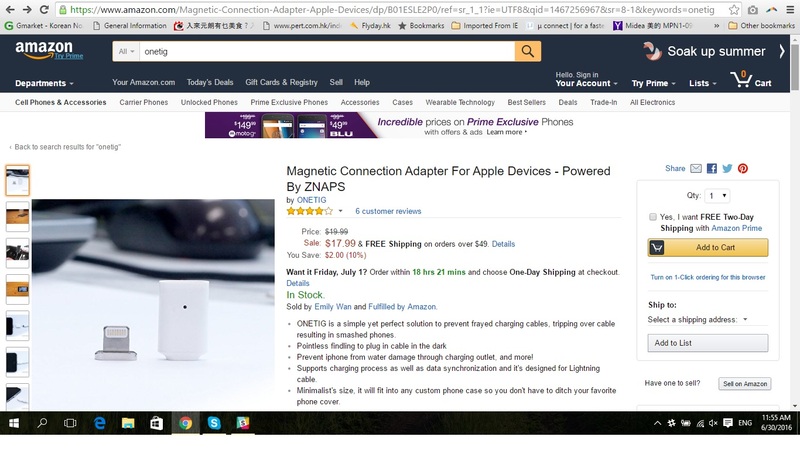 (3) In June 2015, Znaps Inc uploaded the prototype and the concept of our first generation of Znaps Magnetic Adapter (Chinese translation: magnetic adapter) to US’s crowdfunding site Kickstarter and started crowdfunding. That crowdfunding received supports from 70,122 backers, raising $3,007,370 Canadian Dollars (around $18,000,000 Hong Kong Dollars). After that, Znaps immediately started R&D and begin the production flow of the first generation’s Znaps Magnetic Adapter. (4) In September 2015, Znaps Inc released the first generation’s Znaps Magnetic Adapter (attachment 1) and sold to the global market via two dealers. It is not difficult to find the first generation’s Znaps Magnetic Adapter labelled with “powered by Znaps” in Hong Kong. (5) In November 2015 to December 2015, Znaps Magnetic Adapter developed by Znaps Inc was upgraded to the second generation of Znaps Magnetic Adapter (attachment 2). However number of backers suggested for improvements when this model was showcased on Kickstarter. Then, Znaps Inc called for a vote on whether to start shipping the products or make further improvements. As the result, 95% of the voters agreed that there was no need to ship the products immediately (attachment 3), and make further improvements on related products. (6) In January 2016, the dealer Znaps Limited represented under Znaps Inc to participate in the Hong Kong ICT Awards’s ICT Startup Grand Award category for product promotion. This category required participants to join as a company, with it’s products released to the market 3 months before the competition. 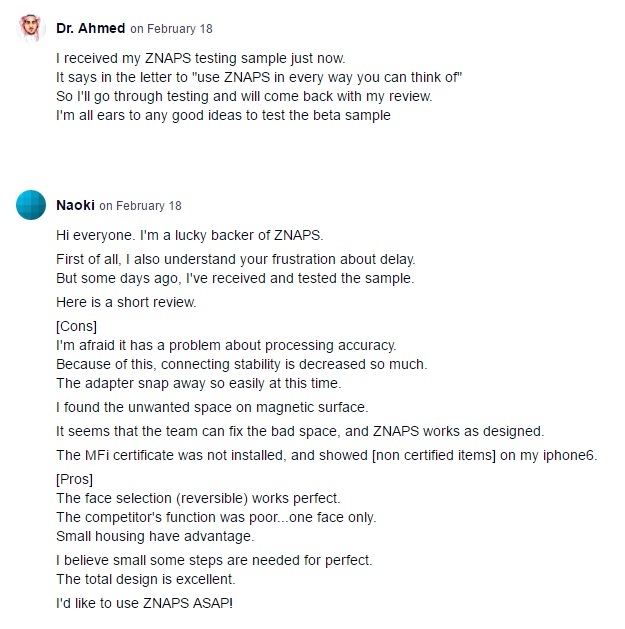 Since Znaps Limited is a company registered in December 2015, thus Znaps Limited revealed its business contact with Znaps Inc in the participation form, clearly described the first generation’s Znaps Magnetic Adapter developed and manufactured under Znaps Inc and the products were sold to 138 countries via dealers without concealing any facts. Finally, Znaps Limited representing Znaps Inc was accepted to enter the competition, and received the bronze award under the Hong Kong ICT Awards’s ICT Startup Grand Award. (7) In February 2016, Znaps Inc shipped the second generation’s Znaps Magnetic Adapter to 500 backers (attachment 4). Furthermore, the second shipment with a total of 10,000 Znaps Magnetic Adapter is to be delivered in July this year. For any accusation of Znaps Inc “taking the money without shipping the product”, violations in participating the Hong Kong ICT Award and those unfounded reports. Our company deeply regret on these, and reserve the right to pursue the matter in court of law. “Tactics Marketing Communications Limited” is entrusted by Znaps Inc to distribute this press release. This has been translated to English by Tsang Ka Chun‎ on Facebook.